I mentioned after cleaning up my grandmother's pasta and bread board that I wanted to attempt making pasta, which I really don't have much experience with. 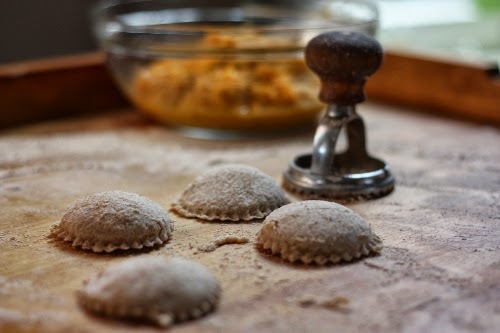 I'd recently gotten a vintage ravioli cutter and was eager to try it out, so decided to give my first pasta experience a go with butternut squash ravioli. 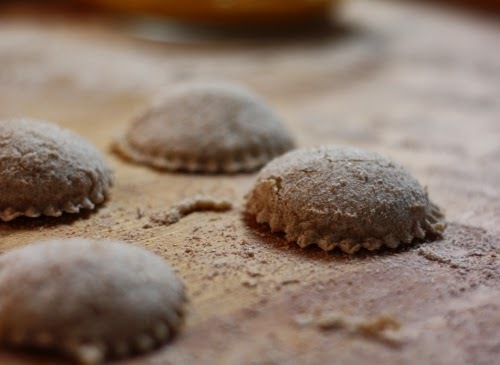 Well, the pictures do not show my frustration and the ravioli did indeed turn out delicious and looks like ravioli but I am definitely going to have to re-think how I am going to prepare for future pasta posts! The dough really did not cooperate as I had imagined it would, I had flour everywhere and you cannot touch the camera when you have dough up to your elbows. So, we might not see as many pasta posts on a regular basis like I had hoped, but bear with me as I figure out the nuances of a camera and flour! 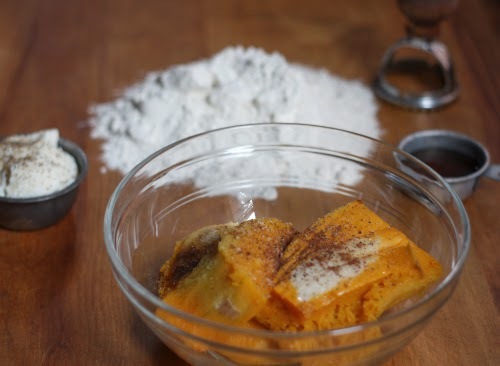 Puree all of the above together in a blender or with a potato masher to complete your ravioli filling and set aside until ready to fill ravioli. 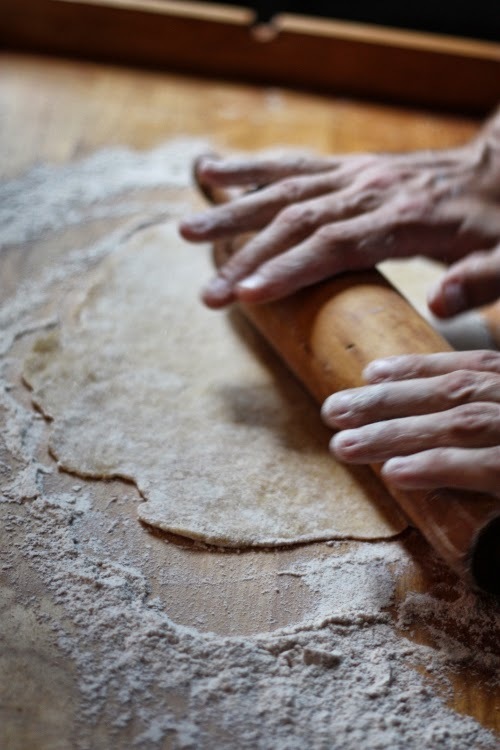 Combine the flour and salt on a board and make a well in the center. 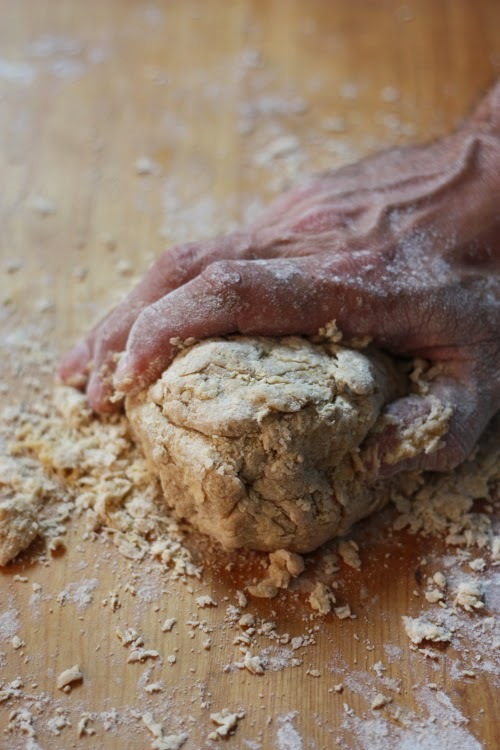 Eventually, I got things together and created a dough ball that really began to take shape. I continued to knead back and forth several times, punching the ball down and folding until I had something I could work with. Several different recipes said to allow the dough to rest for 30 minutes. I needed a mental break and was glad to give it a rest. I wrapped the dough in plastic wrap and cleaned up my work surface, the floor, my hands, my arms, and basically the whole kitchen. After the 30 minute break, I felt ready to tackle the next steps. Next up, rolling out the dough ball into a thin and even sheet. 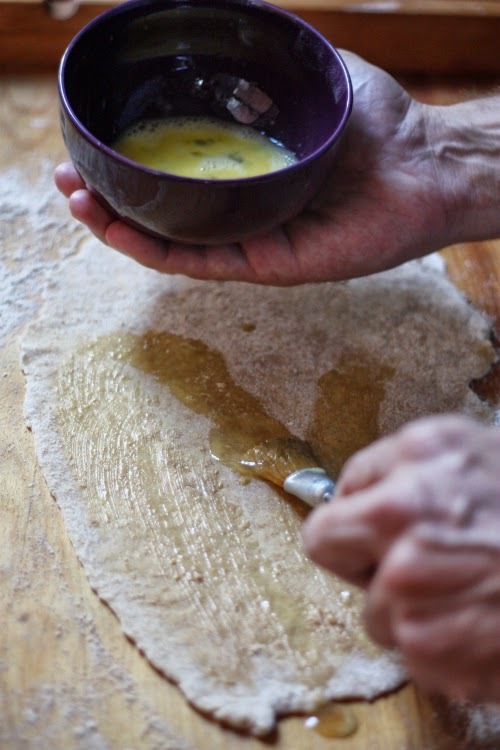 I floured my work surface and began rolling and stretching the dough. I didn't have a pasta rolling tool, was worried I might not get the right thinness. 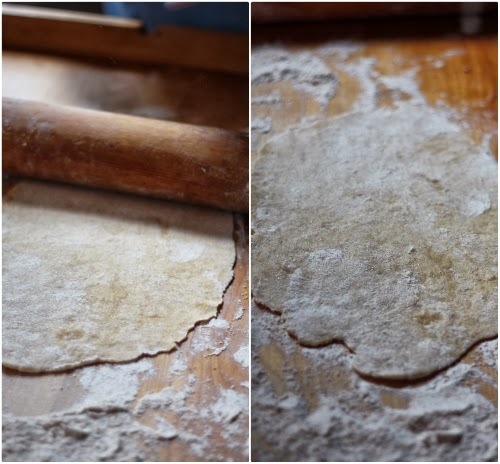 Using my grandmother's rolling pin turned out to be quite simple and I do feel I got the dough stretched out and thin enough to be able to fold and make raviolis. Now these made some sizable raviolis, 4 would be an adequate serving for one person. I was able to rework the leftover dough into another flat sheet and press out 4 more, ending up with 8 large raviolis ready to cook. In conclusion, I indeed made my first batch of homemade raviolis. What did I learn? 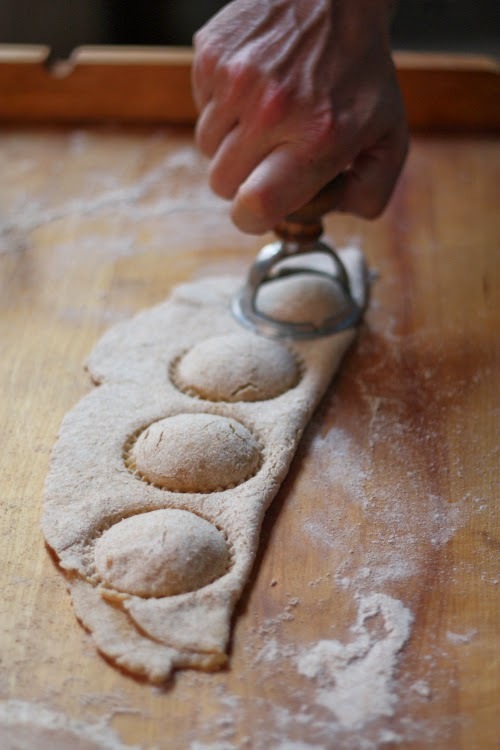 I feel that a dough machine attached to the blender could have helped create thinner pasta sheets which may have helps make more raviolis. This is something I'll probably look into getting. This was a lot of work for 8 raviolis! Pasta is a little messier than I thought going in initially. I ended up boiling and freeze these for a future dish coming later in the week, so stay tuned! I'm keeping things real with this post and admitting my struggles — I am certainly open to any pasta advice others may have out there. So I open this up and ask, are there any glaring issues with what I did and are there tools out there that would make life easier for me as I move forward in the homemade pasta world? Heheh - I feel bad laughing, but I am glad to see you had an experience in the kitchen more inline with one I might have! Oh that is OK! 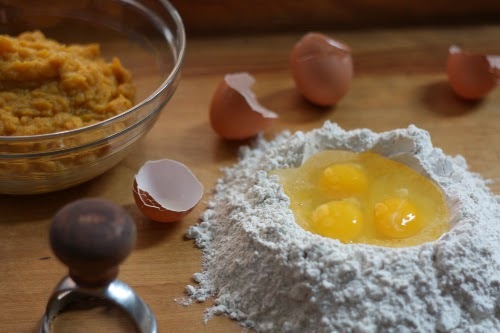 I did look at the pasta series link and mine looked exactly like that while the eggs were sitting in the flour. That was right before things went hay wire! Yes, I have been looking at some remote options for the camera just have not invested in that yet. Thanks as always for "checking" things out! Thanks for the advice! You just cannot go wrong with a bacon goat cheese filling now can you! Thanks for swinging by! I have a pasta machine that mostly collects dust in the closet, but you may have just inspired me to pull it out and try it again! I try photographing some of my baking efforts and always reach a point where I stop because I'm getting my camera gunky. Sometimes I pull my 11 year old into the kitchen to 'help'. Maybe you could teach Basil to help photograph? My sister shared a tip with me a while ago...Use wonton or egg roll wrappers as your "pasta"
I have heard that and you are correct that would be much easier! 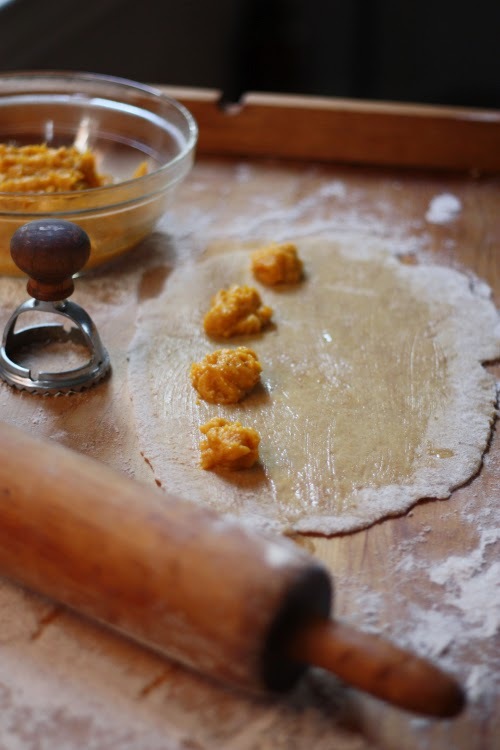 I have been making my own pasta/ravioli (cheese, meat, mushroom) for years and we have just 1 butternut squash left and decided that I needed to do something special with it other than the normal cook and eat. So Thank You for your post I will be using your filling. Im very excited and hopefully will reply with the happy memory of how delicious they taste.